Note: The promotion referenced in this post has ended. We've had such a great response to the DisplayFusion promotion that we can barely keep up with all the images. We're processing them as fast as we can, but in order to make sure everyone has a fair chance to submit enough approved images, we're extending the end of the promotion until October 18th! Thanks to all our submitters, we also reached a milestone this week. After less than two months we now have over 2000 images available on WallpaperFusion! We have even more images being submitted and approved daily, so keep checking in to see what's new. You can also keep tabs on new images by following us on Twitter or visiting our Facebook page to see a featured image every day. We have also updated the image download interface! You can now see a thumbnail preview of how the image will look spanned or split across multiple monitors before you download it. After picking the image you want, just click the thumbnail to download the full size image - it doesn't get any easier than that! We hope that this update makes downloading the right image for your setup faster and easier! As always, we welcome any and all feedback through our contact page. Have an idea, suggestion or issue? Let us know! WallpaperFusion Promotion Updates and More! It's been over a month since we launched WallpaperFusion, and the response has been overwhelming! We have had thousands of image submissions, and we've given away dozens of free DisplayFusion Pro licenses. The contest points system has been a bit confusing for everyone (including us), so we've decided to simplify it a bit. 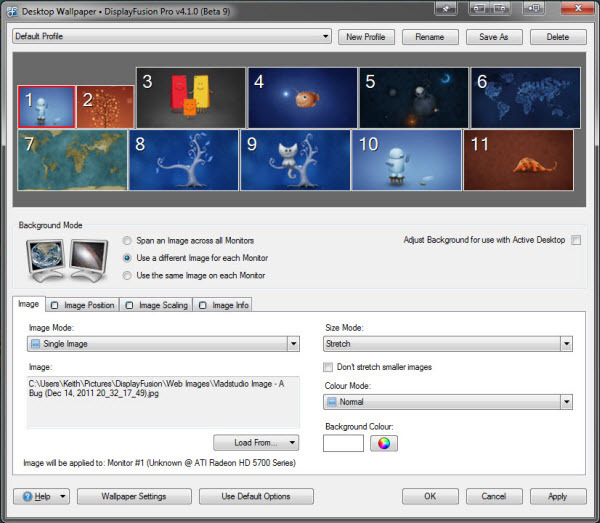 To qualify for a free DisplayFusion Pro license, you just need to have at least 600 reputation points and have 5 published images or more of any size. This should allow you to track your eligibility more easily, as well as making it easier for us to keep track. We have some exciting new things planned for the near future, like mobile apps and amazing DisplayFusion integration, so stay tuned! 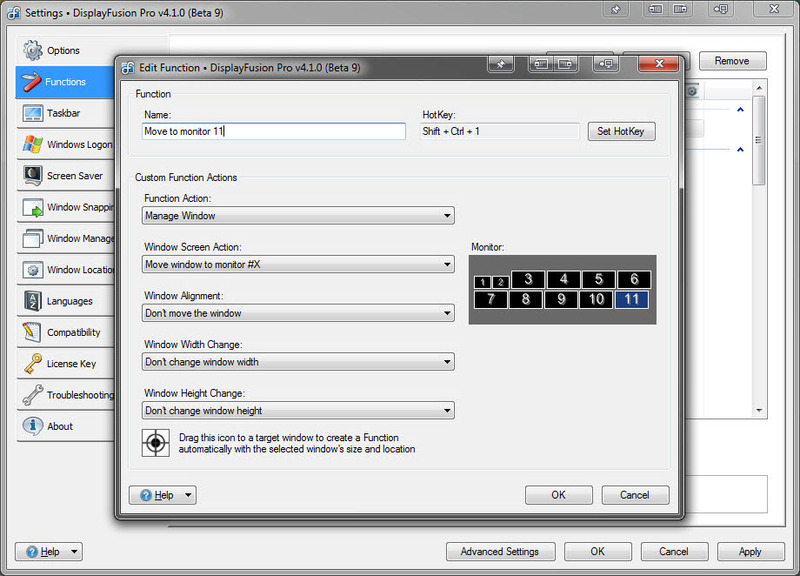 We're pleased to announce that DisplayFusion 4.1 is now available for download! This is an exciting new release that includes a number of new features, changes, and bug fixes. DisplayFusion 4.1 has been fully tested with the final release build of Windows 8. 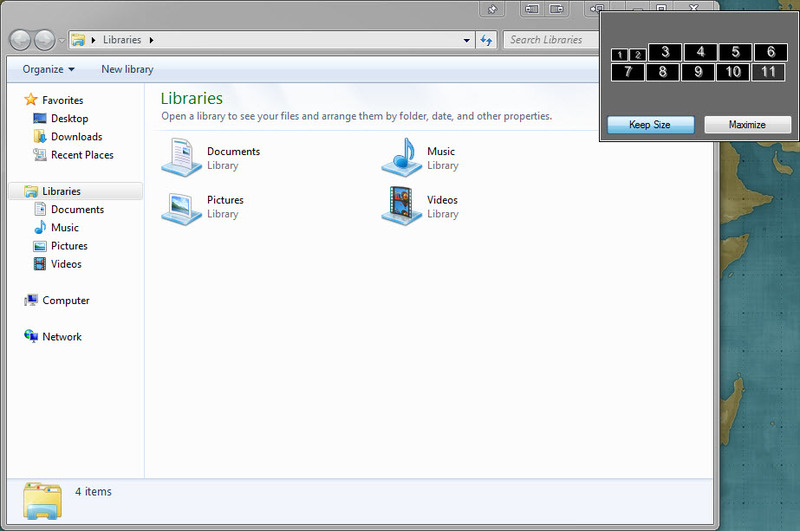 We've also made improvements to the taskbars, built-in DisplayFusion Photos Screen Saver, and more! Earn a Free DisplayFusion Pro License! Want to earn a free DisplayFusion Pro license? We're very excited to announce a new promotion that will run until the end of September. If you submit new images to WallpaperFusion and they get approved, we will send you a DisplayFusion Pro Standard license for free! Please don't take images from other wallpaper sites! Use only images that are your own, creative commons, share-alike or licensed for sharing. We'll be actively monitoring the submissions, and we will email you once you've submitted enough images to qualify. 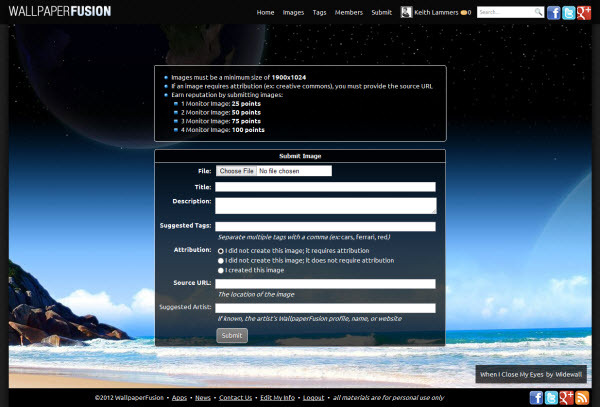 To get started, just login or register for an account, then start submitting images! Update #1: A few people have asked what the criteria are for the wallpaper size (single, dual, or triple) classifications. The wallpaper sizes are determined by the aspect ratio. 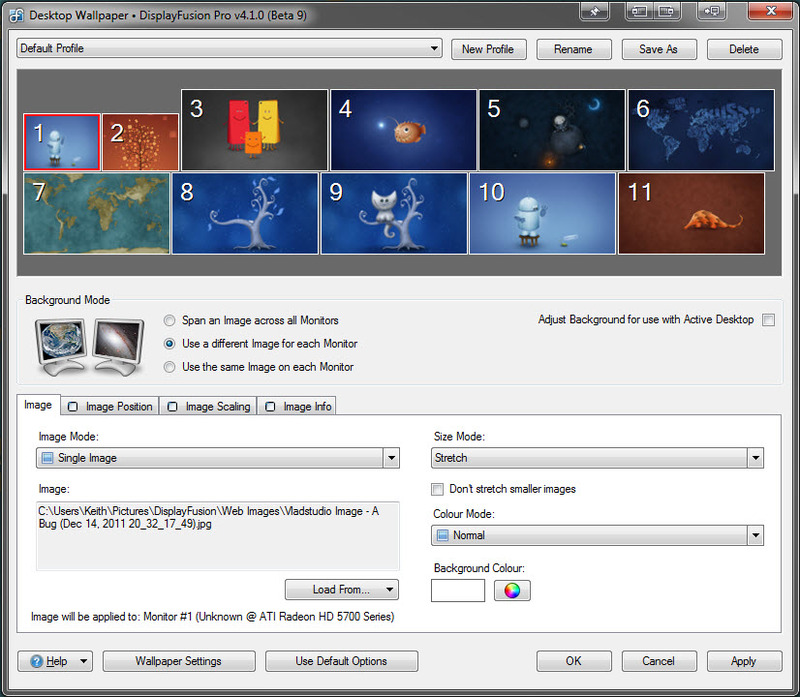 For example, a single-monitor image might be 1280x1024, 1680x1050 or 1920x1080. A dual-monitor image should be at least 2560x1024, 3360x1050 or 3840x1080. A triple-monitor image would be at least 3840x1024, 5040x1050 or 5760x1080. Note that when an image is designed for more monitors the width increases but the height does not. This is considered a wider aspect ratio image. 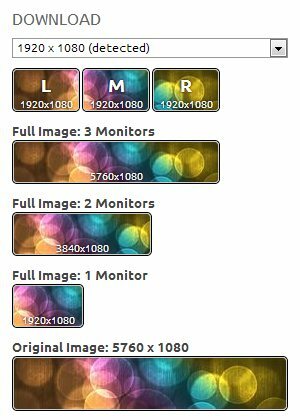 Update #2: We are not looking for any more single-monitor images, they will not count towards the total for this promotion. We have had too many single-monitor submissions, sorry. Welcome to WallpaperFusion! This is a brand new site from Binary Fortress Software that aims to provide a huge selection of high-quality wallpapers for multi-monitor, single-monitor and mobile devices. WallpaperFusion is integrated with DisplayFusion in order to provide easier access to the images, with even better integration coming very soon! 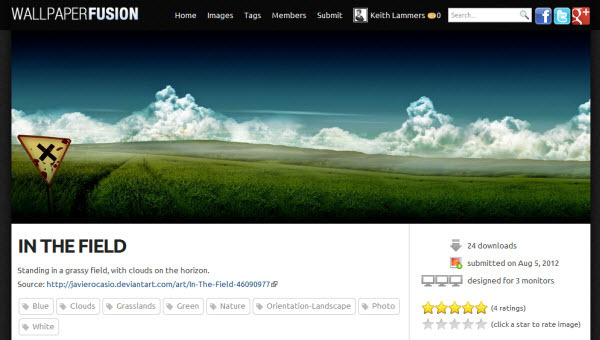 Everyone is encouraged to participate in the WallpaperFusion community by submitting images, as well as rating and commenting on other members' submissions. Members will earn "Reputation Points" for these activities, and you can see how you stack-up in the weekly, monthly, and all-time points leaderboards! We welcome image submissions from anyone and everyone! Whether they're your own original works of art, or they were created by someone else (shared under creative commons-style license), we would love to have them. We're looking for high-quality wallpapers, and the higher the resolution you submit, the more Reputation Points you'll earn! We already have apps available for a variety of platforms, and we have more coming very soon! 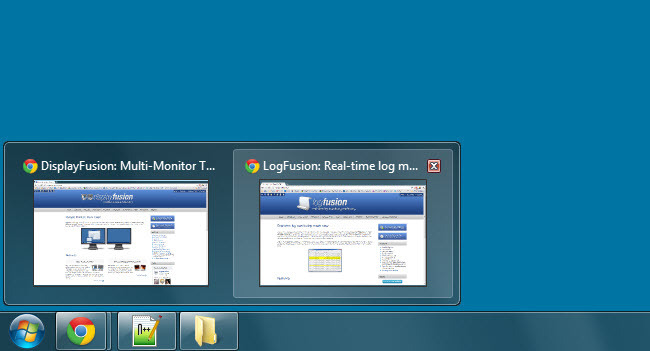 Apps for Windows (DisplayFusion) and Google Chrome are available now. An app for Windows 8 Metro is done, we're just waiting for the Windows App Store to accept submissions. We also have apps for Apple iPhone/iPad, Mac OS X and Android in development, all due out in the next couple of months! 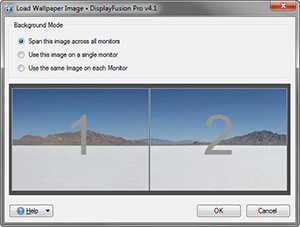 If you have DisplayFusion 4.1 or higher installed on your system, you can use WallpaperFusion's "Download with DisplayFusion" link to load the wallpaper directly into DisplayFusion. We'll also be making the wallpapers accessible right from within DisplayFusion very soon! Create a WallpaperFusion account, or simply login with your Facebook account and a WallpaperFusion account will be created automatically for you. Come join our community and start earning your Reputation Points today! How Many Monitors Does DisplayFusion Support? How many monitors does DisplayFusion support? The short answer is: As many as your video card(s) and display drivers can handle. Note that some cards have more outputs than they can physically enable at one time, which cannot be worked around using software (i.e. many cards have 3 outputs, but only 2 can be enabled at one time). As we'll detail in this post, we were recently able to re-test DisplayFusion with 11 monitors. We've also had customers report that DisplayFusion works well in their 12 monitor setups. Which DisplayFusion features worked in the 11 monitor setup? 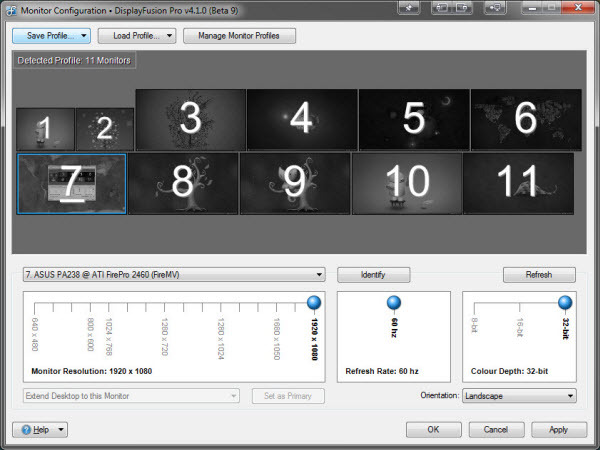 All of the DisplayFusion features worked great in the 11 monitor setup. Certain actions, such as applying the wallpaper settings, or reloading the taskbars take a bit longer than on a 2 or 3 monitor setup, but that's to be expected, as there's a lot more work to be done behind the scenes when handling that many monitors. See the following screenshots for what the various configuration screens look like with 11 monitors attached. Interestingly enough, there are a couple of bugs in Windows when using this many monitors. 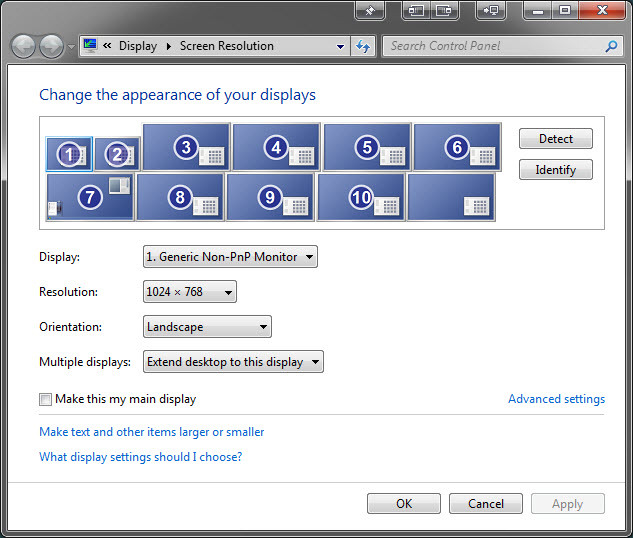 The Windows Screen Resolution settings window doesn't put an ID on any monitors with an ID higher than 10. 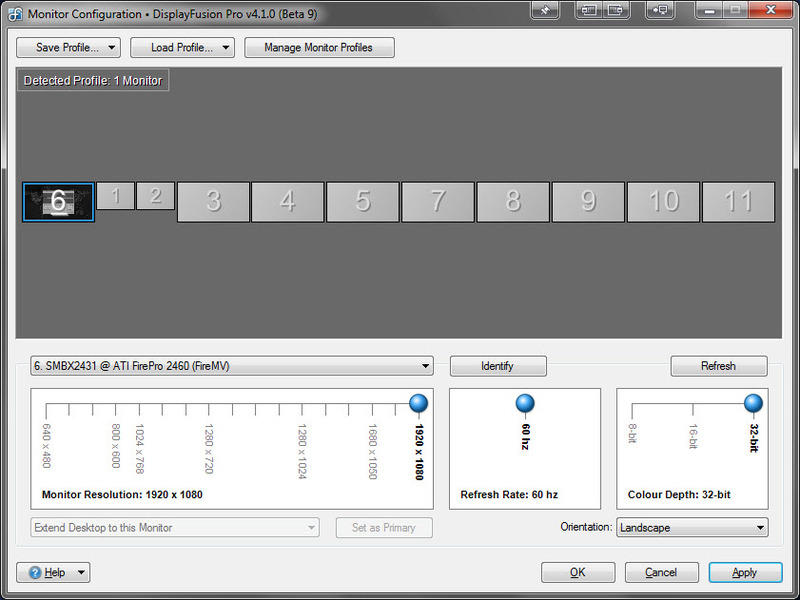 The DisplayFusion Monitor Configuration shows the monitor ID on all monitors, including ones with IDs higher than 10. Additionally, the built-in Windows Screen Savers crash (regardless of whether you configure them using Windows, or DisplayFusion) when running more than 9 monitors. 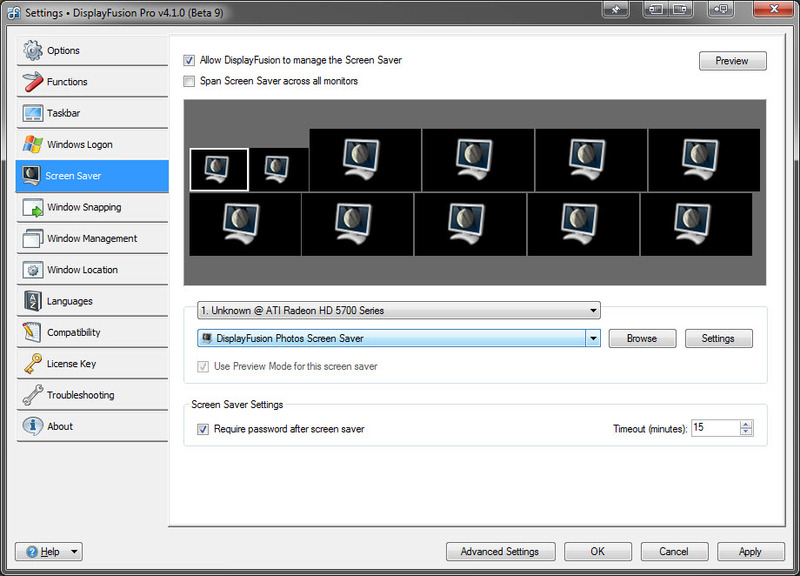 To prevent the Screen Saver crashes from showing up in DisplayFusion, we've added a check that will prevent the Windows built-in Screen Savers from being selected in the DisplayFusion Screen Saver configuration on systems that have more than 9 monitors enabled. Which DisplayFusion features are really helpful when running 11 monitors? While all of the DisplayFusion features are great with 2 or more monitors, we found the following features to be especially helpful when using 11 monitors. Monitor Configuration: The Windows Screen Resolution settings can be a bit cumbersome to use, especially when enabling and arranging many monitors. Many of the steps require you to apply the settings before performing the next step. For example, you can select each monitor to be enabled, but then you must apply the settings before re-arranging them to the correct layout. The DisplayFusion Monitor Configuration feature not only allows you to enable and arrange the monitors before applying the settings, but it also allows you to save different monitor layouts as Monitor Profiles, so that they can be quickly applied with a few clicks in the future. Monitor Selector and Custom Functions: When you've got 11 monitors, being able to specifically select which monitor an application should move to becomes a very handy tool. Using DisplayFusion's Functions, you can achieve this in a couple of ways. 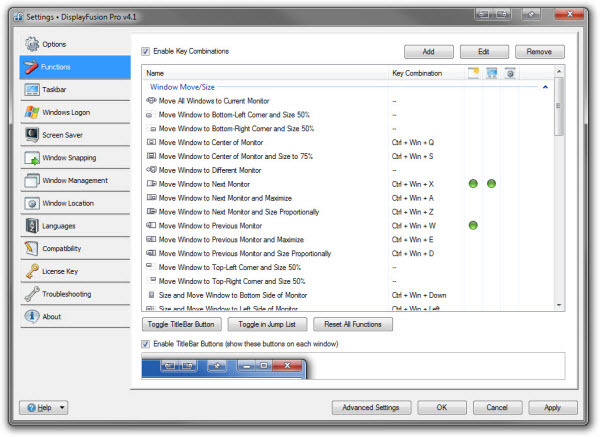 Using the Move Window to Different Monitor Function, which shows a monitor selector, you can choose which monitor the application should move to when running the Function. Alternatively, you can create custom Functions that automatically move the application to a specific monitor when the Function is run, and skip the step of having to choose a monitor each time you want to move the application. Mirror Monitor/Window Function: When running a system with many monitors, it's entirely possible that you may have monitors located in different physical areas, outside of your viewing range. There are two DisplayFusion Functions that can help in this situation. The Mirror Monitor Function will mirror the output of the selected monitor into a separate window that can be resized and moved to any other monitor. The Mirror Window Function will do the same, but it will use the output from the selected application. If you've got a setup with 6+ monitors, feel free to leave some feedback in the comments to let us know how DisplayFusion works for you, and which features you find the most useful when running 6+ monitors! As always, if you need any technical support, or have any questions, feel free to contact us. 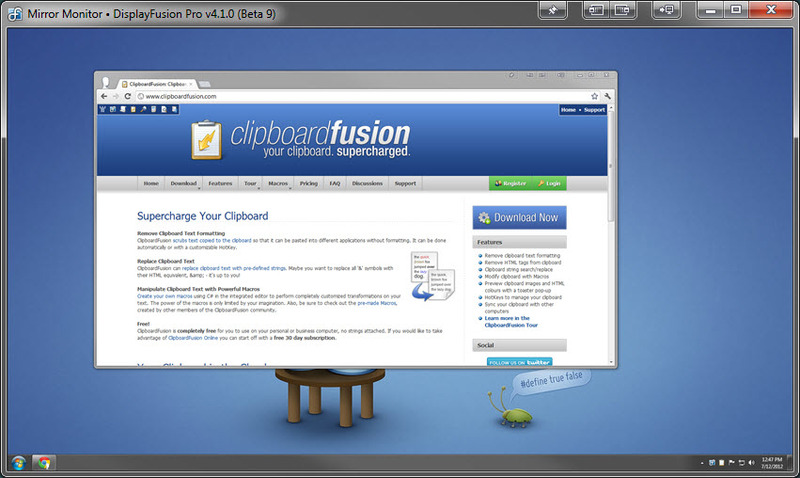 We're pleased to announce that ClipboardFusion 2.1 is now available for download. There are some great changes, including a bunch of bug fixes, enhancements, and some new Macro API functions. Since we haven't announced the last two minor versions of ClipboardFusion, we're including the changes from those versions in the following list as well. The full change log is available here. We encourage everyone to update to the latest version, in order to take advantage of these improvements. 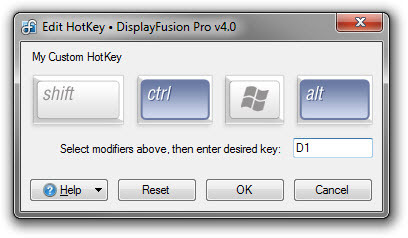 DisplayFusion 4.0.1 is now available for download. This version consists mainly of bug fixes, performance and stability fixes, and a few small tweaks to various features. We encourage everyone to update to this new version today to take advantage of these improvements. If you've already purchased DisplayFusion, it's a lifetime license, so you can upgrade to this version at no cost! If you would like to see a complete list of all the changes, please visit the DisplayFusion Change Log. We'd like to send out a big thanks to everyone who helped to complete the DisplayFusion translations, and the thousands of people that helped test the Beta versions. Thanks everyone! We're very happy to announce that DisplayFusion 4.0 is now available for download! This version includes a bunch of great new features. 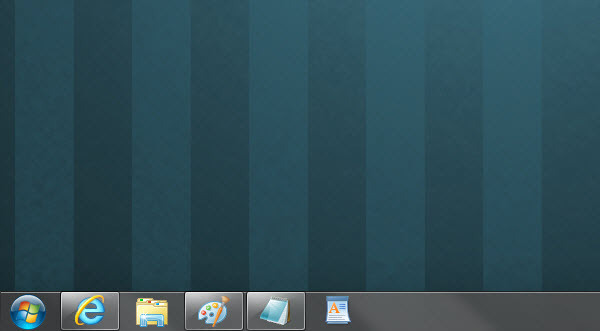 Taskbars now include tray icons, and an optional, alternate Classic style Start Menu. 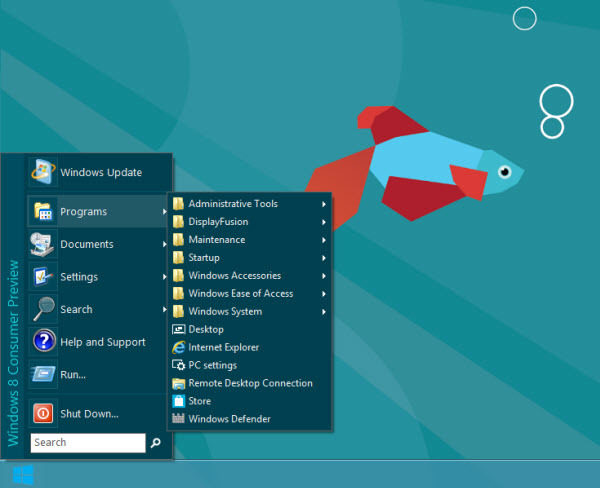 The alternate Start Menu is a great option for anyone who wants Start Menu functionality in Windows 8. 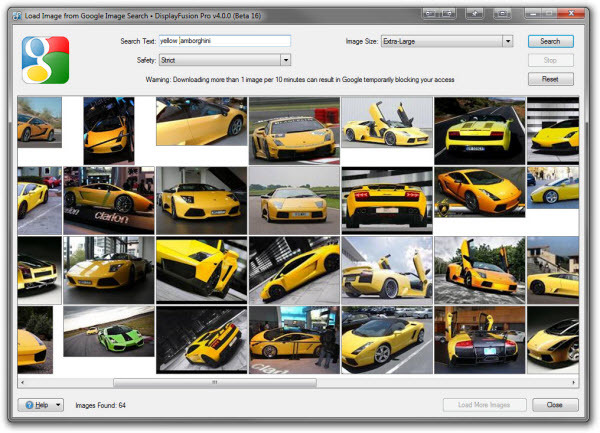 Google Image Search, Bing Image Search, and deviantART have been added to the Online Wallpaper Providers. 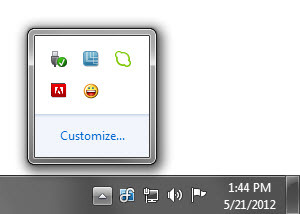 Desktop Icon Profiles allow you to save and restore your favourite Desktop icon layouts. 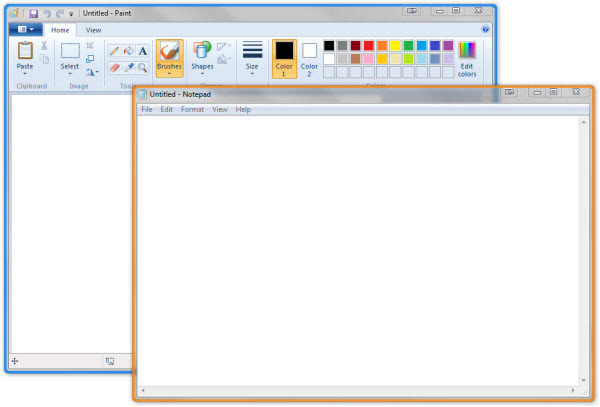 Aero Colour Settings allow DisplayFusion to set the Aero Colour based on either the dominant colour of the current wallpaper, or the current application's icon (Windows 7 and Windows 8 only). We're still hoping to finish up the translations for Catalan, Finnish, Galician, Japanese, Latvian, Norwegian, Slovak, and Slovenian. If you're interested in helping out with the translations, please contact us. We encourage everyone to update to this new version today to take advantage of these improvements. If you would like to see a complete list of all the changes, please visit the LogFusion Change Log. 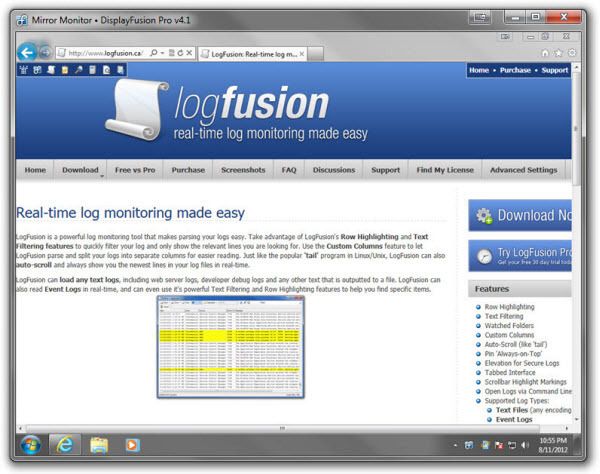 If you've already purchased LogFusion, it's a lifetime license, so you can upgrade to this version at no cost!